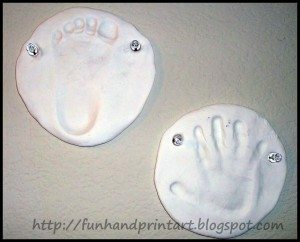 These adorable clay hand and foot prints make a fabulous decoration for your home, as a fun gift, & a great keepsake! I used Crayola Model Magic to make these. It comes in all different colors. If you use white, you could also color the impression or around the impression using markers – be sure to let it harden 1st. This clay is great! It feels like marshmallows & isn’t messy at all. To make, flatten the model magic into any shape that you prefer. Press the hand or foot into it. Poke holes using a pencil (or whatever else you can think of) so that you may hang it later with tacks, nails, or even to string ribbon through. Set aside for at least 24 hours to harden. *Disclaimer: This post contains Amazon Affiliate Links. This is wonderful!! If you would like this in ceramic please come by http://etsy.com/shop/Dprintsclayful and I can do this for your from anywhere. I will send out a printing kit.